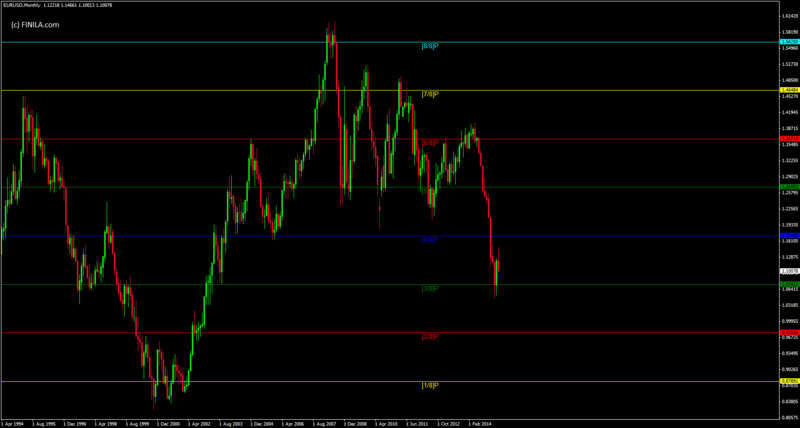 The indicator Murrey match lines is similar to pivot points and Fibonacci retracement. MML was created based on the observations of Gann studies and is a simple way to implement Gann. It was developed by T. Henning Murrey. +2/8 – This market is too high and needs close monitoring. -2/8 – This market is too Low and needs close monitoring. Price is between 3/8 and 5/8 MML’s about 40% of the time. These lines are the hardest to penetrate on the way up, and give the biggest resistance on the way up or support on the way down. (Prices may never make it through these lines). down fast. If prices do not stall at this line they will move up to the 8/8 th’s line. is true whether prices are moving up or down. fall further looking for support at a lower level. this line and spend 40% of the time moving between this line and the 5/8 th’s line. up fast. If prices do not stall at this line they will move down to the 0/8 th’s line. Reverse of MML usually will not occur precisely on the line but little above or under it. If price is above the 5/8 line and falling, it will generally stop and consolidate around 5/8 first before heading lower. The same is true in the opposite direction: if price is below the 3/8 line and rising, it will generally stop and consolidate around the 3/8 line before heading higher. If price moves above 8/8, 75% of the time the price will reverse off the +1/8 line and retest 8/8 before moving higher to +2/8. Similarly, if price falls below 0/8, 75% of the time the price will reverse off the -1/8 line and retest 0/8 before moving lower to -2/8. 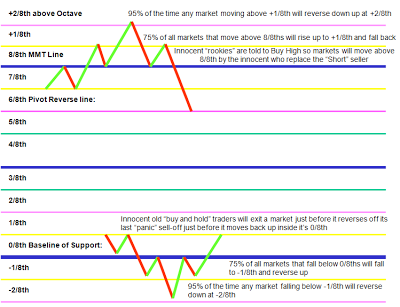 Basically, when the market is between the lines, it is in an undecided state (i.e a trading range). If it is above the 5/8 line then the market can be considered bullish, likewise below 3/8 we are in a bearish market. 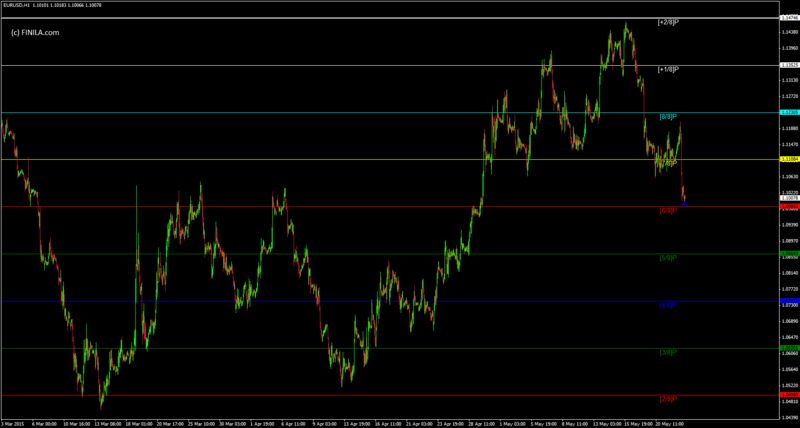 Hence 5/8 is a great support level for re-entering a long trend and 3/8 for short. A break of these lines can be very important. For example- If the market has been above 5/8 for a period of time but breaks below, that is a sign of bullishness fading. A drop to 4/8 almost always follows, and at that point 5/8 becomes significant resistance, because a break back above it would represent a re-establishing of the bullish scenario which had just previously failed. If the market does indeed re-test 5/8 and fail, that confirms that the bullish sentiment has pretty much gone and an attempt at a move to 3/8 can be expected. If the market then breaks below 3/8, it has definitively turned bearish – and 3/8 then becomes strong resistance as a break back above would represent another change in sentiment, this time back to indecision. It’s important use the Murrey on all the timeframes.